Over the past few years, cryptocurrency has been thrust into the mainstream consciousness, with currencies like Bitcoin and Ethereum pitching to become universally legitimate methods of payment. While questions around crypto’s place in the world remain, blockchain, the payment technology behind it, is making significant strides forward in a number of key markets and is tipped to become the backbone of data collection in future industry. One of the key markets it’s impacting is credit card transactions. Here’s a quick look at how blockchain is looking to revolutionise card payments. Not to be confused with Bitcoin, blockchain is simply the technology that was developed alongside it to record and store crypto transactions. The easiest way to understand blockchain is to imagine a series of blocks that are built into a chain as transactions take place. Each block stores hundreds of transactions, with each transaction designated a complex data code for reference. Transactions are stored chronologically, with the system validated by a peer-to-peer network of computers, as opposed to one central network. Once a transaction is added to a chain, it cannot be reversed, manipulated or edited in any way. Because of blockchain’s decentralised nature and its unalterable structure, the technology has attracted the interest of various industries looking to adopt it for their payment framework, including credit card providers. Even though the current credit card payment structure is fairly efficient, there are a number of issues associated with it. Primary concern surrounds high merchant transaction costs (around 1.5%-3.5% per payment); the number of financial intermediaries involved with each transaction; chargeback fees and the system’s vulnerability to manipulation. Blockchain provides solutions in all of these areas. Blockchain’s decentralised system removes the need for the intermediary ‘middlemen’, significantly reducing the cost per transaction and chargeback amounts. Any queries are quickly answered by blockchain’s immutable data, whilst its impenetrable makeup removes any risk of data manipulation. Essentially, blockchain provides a significantly quicker, cheaper and more secure system to the one currently in operation. There’s no better indicator of blockchain’s promise in the card market than the recent investment of the industry’s major multinationals. Towards the end of 2017, Mastercard launched its own blockchain technology, designed for use in B2B markets and cross-border payments, before applying to patent a multi-blockchain in October last year. The same month, Visa began its launch process for a blockchain-based identity system, putting the two brands in direct competition on their blockchain projects. American Express has also added blockchain technology to its infrastructure, as well as applying for its own patents. With all the big names pumping money into the technology, it’s apparent blockchain has a critical part to play in the coming years. While blockchain offers plenty of promise and some considerable improvements, there are a few lingering concerns in relation to its introduction to the market. There is user apprehension around volatility in the cryptocurrency market and the complexity and accessibility of the systems currently available, but blockchain’s major question lies in its scalability. As it stands, the energy involved to power the cloud technology around the Bitcoin market is the equivalent to that of Romania. Admittedly, consumption levels have dropped off significantly since November of last year, however blockchain will have to continue to develop a lower energy solution if it’s to truly be brought into mainstream use. 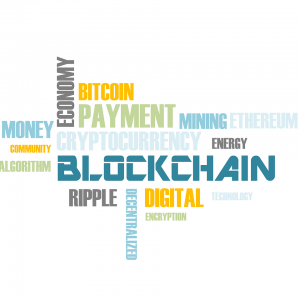 Should an efficient energy solution be found, blockchain is set to become a cornerstone of credit card transactions, as well as a fundamental part of managing everyday finances across a number of industries. What’s certain is that we’ll hear plenty more about blockchain technology in the next few years.